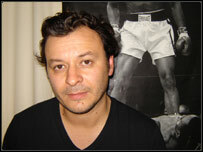 As he prepares to release his debut solo album, the Manic Street Preachers' lead singer James Dean Bradfield has denied the Welsh rockers are splitting. Speaking from the studio in which he part-recorded the album, Bradfield said the Manics were on a "brief hiatus," but already working on new material. Describing being in the three-piece as "mafia-esque", he said it would take "a hell of a lot" for them to split. He says he feels no rivalry with Nicky Wire, who has also gone solo. Possessing a firm handshake which belies an easy-going nature, Bradfield was in a relaxed mood as he took a break from recording tracks for BBC Radio 1 at the Stir Studios in Cardiff. But he was also clearly excited about the release of his debut solo single That's No Way To Tell A Lie on 10 July, followed by his solo album The Great Western on 24 July. Despite a collective decision by Bradfield, bassist Nicky Wire and drummer Sean Moore, to take a two-year break from the band at the end of their British tour in April 2005, the singer said could not resist the musical pull. "I decided to start making music again because I went insane and became dysfunctional," he said. "I became quite a grumpy, uncommunicative person. "I realised the reason for this was because I had been in a band since the age of 15 and there was no way I could function without the promise of writing and performing music." The fruits of his new labours have already been garnering some favourable reviews in the music press, but Bradfield denied this spelt the end of the Manics. In fact, the singer has already begun writing and recording tracks for the band's new album, which he said will be "in your face," "aggressive" and "rock and roll". "I've said before that being in the Manics feels slightly mafia-esque, you know, once you're in, you're in," he said. "It would take a hell of a lot for us to split up at any point in the future. "But we have taken a brief hiatus, we committed to not releasing anything for two years because we realised we had been in a band for 21 years. "After finishing the tour we felt we deserved to take a break, get some perspective and then make the next Manics album is as good as we can make it." In the meantime, Bradfield was keen to play down any conceived rivalry with Manics bassist Wire, who is planning to release his debut solo effort later this summer. "I don't feel I'm in competition with Nicky," he said. "I just feel that anything the three of us does outside of the band that gets some success and some credit - it's good for the band. "Nick's always been a bit more of a competitive person than me in terms of sport and in general terms of arguing the point on any given day (but) I don't feel as if we are competing with ourselves whatsoever." But he did admit he missed both Wire and Moore when it came to putting together his own album. "Playing with different musicians was definitely the hardest part," he said. "I'm not saying I haven't enjoyed that. I've only done three gigs so far, but that natural telepathy and connection or chemistry I have with Nick and Sean, it's hard to recreate that with other musicians. "You've got to go looking for it when you're in the rehearsal room with them. And that's strange. These are the things that you take for granted for so long when you are in a group like ours. "And it's a bit emotional when I go out on tour with another band because I do miss Nick and Sean. "The challenge of all those things, of all the unfamiliar territory, of working with other people, that's what makes it interesting though." This page was last modified on 24 July 2018, at 19:46.